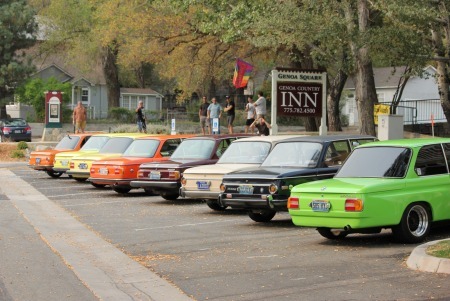 HIGH SIERRA ’02 FEST 2016 SEPTEMBER 9-11, 2016 You are cordially invited to bring your vintage BMW 1600 or 2002 and join us for the second annual High Sierra ’02 Fest to be held again in the beautiful Carson Valley, at the base of the Sierra Nevada Mountains. We will begin with a meet and greet on the evening of Friday September 9th, in Minden, Nevada. On Saturday morning we will meet up for a group drive that will take us up into some great driving roads in the nearby mountains. 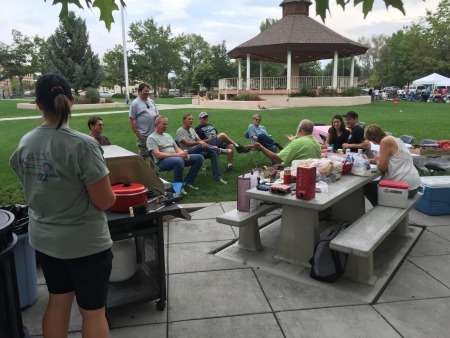 In the afternoon we will gather at historic Mormon Station State Park, in the town of Genoa, for a BBQ, social, car time, and a tech session presented by Jack Fahuna. 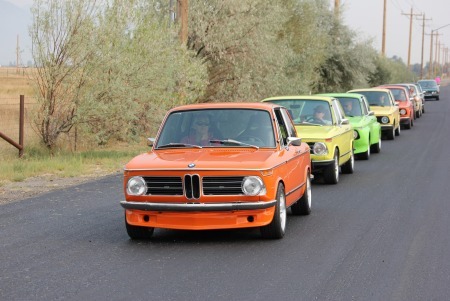 On Sunday morning an optional drive will take place for those who are interested, with a breakfast stop and opportunities to peel off and head home, along the route. Lodging is available in Minden at the Carson Valley Inn, Holiday Inn Express or several smaller establishments in the Carson Valley or in Carson City, 20 miles to the north. The event is free, and T-shirts (Beefy-T with a nice graphic and no advertising) will be available for $20, by pre-order only. Space is limited, because of the size of our venue, so please contact Ed Blake at adirtnerd@frontier.com to confirm your attendance, for more information, or if you would like to reserve a T-shirt. Requests for T-shirts need to be received by August 1, to allow time for delivery. Jack Fahuna just let me know that he and others will be leaving from his shop at JF Pro BMW at 14412 Victory Blvd. #B in Van Nuys, at about 8 on the morning of Friday, Sept. 11. Anyone wishing to caravan to the event is welcome. Great. Looking forward to seeing you again, and checking out your car! BELOW IS DETAILED INFORMATION FOR THE EVENT HIGH SIERRA 02 FEST 2015 FRIDAY SEPT. 11th – 6 to 8 pm. Meet and Greet and discuss the event activities. Pizza and drinks provided. WHERE – 1559 Wildrose Drive, Minden Nevada. 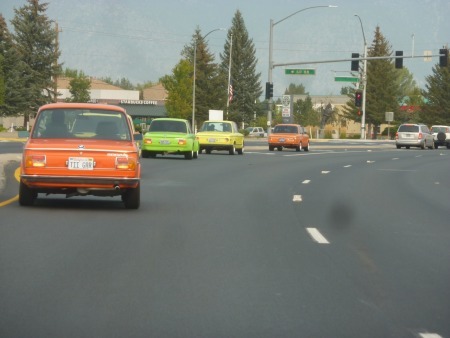 From US 395 turn south at the stoplight at 6th Street. Continue 3 blocks on 6th to County Rd. Turn left on County Rd. and drive 4 blocks to 2nd Street. Turn right at 2nd and the second house, the blue two story on the corner, is where you want to be. The gate to the back yard will be open on the driveway, so just come on in. There is plenty of street parking, or park in the driveway if it’s available. An alternate and easier way is to stay on 395 and turn south on 2nd Street. However, if you have a lowered car and/or air dam there is a sharp dip that may drag. SATURDAY SEPT. 12TH – MORNING DRIVE – 9:00 to 1:00 - We will stage at the Minden Park, which is at 6th Street and Mono. Take the stoplight at 395 and 6th south to the park. We will head out at 9:00 sharp. If you did not make the Friday Meet/Greet, please arrive by 8:45 so that we can go over the drive schedule prior to departure. If you have a walkie-talkie, you may want to bring it, as it may be useful on the drive. 1:00 – 3:00 – Lunch and car clean-up/down time. 3:00 – 7:00 – Static Car Display, Tech Talk and BBQ Sunday Sept. 13th - MORNING DRIVE - We will stage at the Minden Park, which is at 6th Street and Mono. Take the stoplight at 395 and 6th south to the park. We will head out at 9:00 sharp. This drive is designed as one where those that want to head home can just head out whenever and wherever along the way that it’s convenient. We will be intersecting highways 395 south, 88 west and 50 west on this drive, before returning to Minden. Thank you for your interest, and I hope that you can make it over! 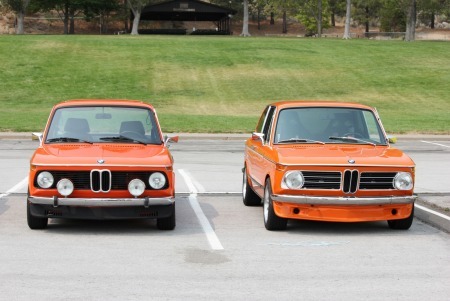 It should be fun getting a bunch of 02's together, and some nice mountain drives too. Mike, Glad to hear that you're interested in attending. I know of another 02 coming down from Reno. We also have one or two from Carson, and maybe one from Stagecoach....fun to see that there are so many 02's lurking nearby! Soon I'll have a detailed schedule out for the event. Steve, We're planning on getting together around 6 on Friday evening, to discuss Saturday's schedule, meet and greet, have some snacks/drinks etc. I'm sure we'll hang out for some time, so no worries if you can't make it by 6. Hope you can make it, and look forward to meeting you and checking out your car. Barry, I'm really sorry, but think we'd better keep the event to 1600's and 2002's. I'm just afraid that if we open the door to other models we may end up with more than I can handle, but thank you very much for your interest in the event. As of now I think we have about 8-10 cars. Some have said that they are planning on attending, but haven't received a commitment yet, and everyone that has done this sort of event has said that many will wait until very near the event to commit. I will be firming up the schedule for the event, and will send your way when it's ready. This is my first time organizing something like this, and just thought that it would be fun to get a bunch of 02's together.....and I think this area provides a great venue. Thanks for your interest, and hope to see you at the event! 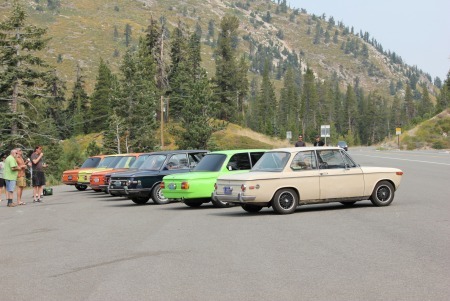 HIGH SIERRA 02 FEST SEPTEMBER 12, 2015 CARSON VALLEY NEVADA YOU ARE INVITED TO JOIN US FOR THE FIRST ANNUAL HIGH SIERRA 02 FEST TO BE HELD SEPTEMBER 12, 2015 AT MINDEN, NEVADA, JUST 20 MINUTES EAST OF LAKE TAHOE. THE EVENT WILL BEGIN ON THE EVENING OF FRIDAY SEPTEMBER 11TH AND CLOSE OUT ON SUNDAY SEPTEMBER 13TH. 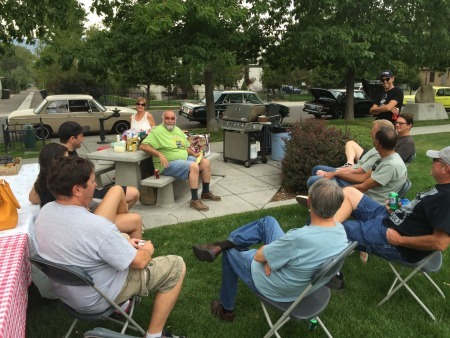 ACTIVITIES WILL INCLUDE GROUP DRIVES IN THE NEARBY SIERRA NEVADA MTS, A STATIC CAR SHOW/SOCIAL/ BBQ, AND TECH SESSION PRESENTED BY JACK FAHUNA. A BLOCK OF ROOMS HAS BEEN RESERVED AT THE CARSON VALLEY INN MOTOR LODGE. FOR LODGING CALL 1-800-321-6983 EXT. 1 AND MENTION GROUP NUMBER 504254 FOR AN $85 ROOM RATE. THE ROOMS WILL BE RELEASED IF NOT RESERVED BY AUGUST 20, SO PLEASE MAKE YOUR RESERVATIONS SOON. 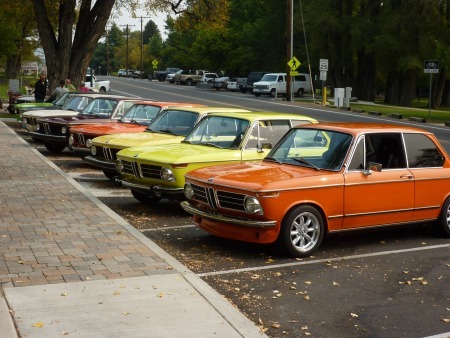 ALL BMW 1600’S AND 2002’S ARE WELCOME. THERE IS NO COST TO PARTICIPATE IN THIS EVENT, OTHER THAN LODGING. FOOD FOR THE SATURDAY BBQ WILL ALSO BE PROVIDED. T-SHIRTS HAVE BEEN DESIGNED FOR THE EVENT AND WILL BE AVAILABLE TO THOSE WHO WOULD LIKE ONE AT OUR COST OF $20 EACH. PLEASE CONTACT ED BLAKE AT adirtnerd@frontier.com IF YOU PLAN TO ATTEND SO THAT WE CAN MAINTAIN A HEAD COUNT AND PROVIDE YOU WITH T-SHIRT AND DETAILED EVENT INFORMATION. 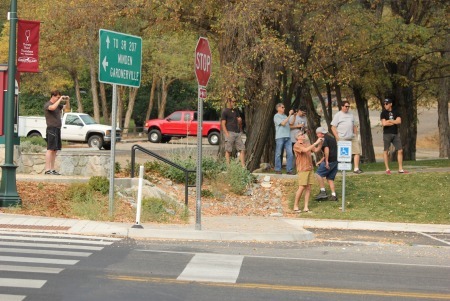 You are invited to join us at the inaugural High Sierra 02 Fest to be held September 12, 2015 at Minden, Nevada. This will be a free event, with the only cost for participants being lodging. The event will begin on the evening of Friday September 11th, with check in at the Carson Valley Inn Casino, and an informal meet and greet dinner. 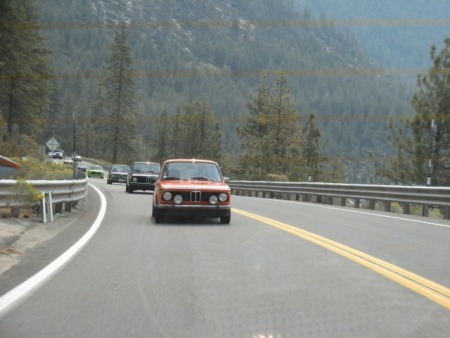 Activities on Saturday September 12th will include a morning drive that will take us through the picturesque Carson Valley and up into the nearby roads of the East Slope of the Sierra Nevada Mountains and Lake Tahoe, providing a great driving venue for our cars, photo ops, and a chance to enjoy our cars and each other. In the afternoon we will have a car show, barbeque and a tech session presented by Jack Fahuna. For those who have the time, we will also have a Sunday morning loop drive through the mountains, that will provide opportunities for any driver that wants to, to break off and head home at their conveneince. A block of rooms has been reserved at the Carson Valley Inn motor lodge for $85 per night, double occupancy. These are nice rooms, located on the first floor, which will let you park your car right outside your door. In order to make your room reservation, please call 800-321-6983 ext. 1 and mention group number 504254. This will guarantee you the $85 rate. You need to make your reservation before August 1, 2015, as any rooms not reserved by that time will be released. There are no other charges to attend this event. 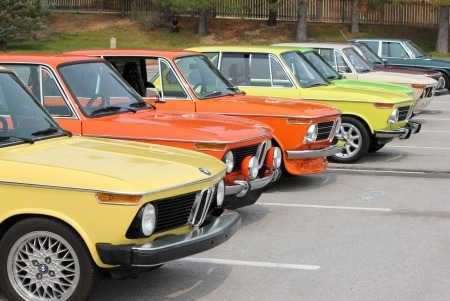 The intent is to keep this a low key event, letting 02 owners get together to enjoy each other’s cars and company, therefore we have set a limit of 20 cars/lodging rooms for this first year. If you are planning on attending, please handle the room reservations on your own, and please contact Ed Blake at adirtnerd@frontier.com to confirm your participation and let me know how many people will accompany you, or if you have any questions regarding the event. I am working on a design for T-shirts, and will contact those signed up for the event with information regarding cost and order information, for those that may be interested. 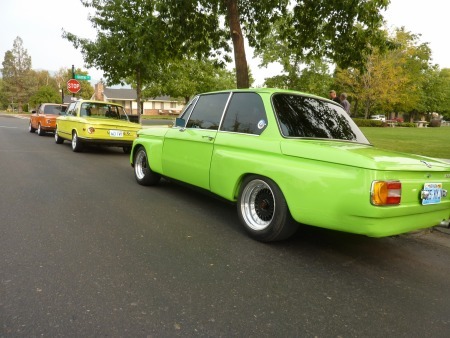 We feel that the Carson Valley area, just 20 minutes east of Lake Tahoe provides a great venue for enjoying our cars, and hope to see you there. I'm installing new front grills on a 73, and am not sure of the best way to secure the black out covers on to the grills. I would really appreciate help with type of adhesive to use and technique, as I really don't want to mess this up. Thanks!